The Biafra students drawn from the various universities and higher institutions across Biafra land under the platform of Voice Of Biafra Students, (VOBS) on Saturday, 24 March 2019 held their nationwide general meeting in Enugu state to proffer solutions to some issues that hinders Biafra students from massively joining the struggle to restore Biafra. According to information Obtained by ECO CITY REPORTERS, The meeting which lasted all night was hosted at University Of Biafra formally University Of Nigeria Nsukka branch of the group. Some principal officers in Enugu state IPOB attended the conference to encourage the students who are out to give their contributions for the speedy restoration of Biafra. During the interactive section of the meeting, they looked into some issues that affects the students in Biafra land and the ways to rectify it to ensure active participation of all the higher institutional students in the agitation to restore Biafra. 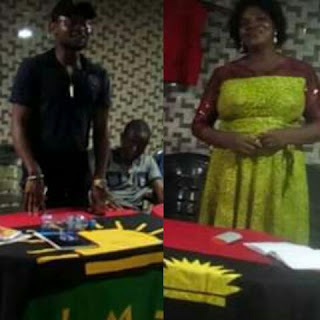 Members of the group who attended the all night meeting were taught how to be a good ambassadors of IPOB in their various higher institutions across Biafra land, in order to ensure optimal participation of other students.